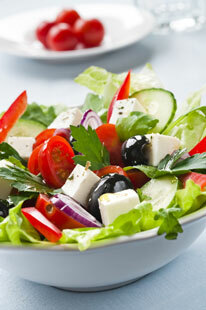 Bring the flavors of the Mediterranean to your kitchen with this Greek salad recipe. There are numerous versions of this salad in Greece with each village having its own recipe. It is a rustic dish and always begins with tomato, cucumber, feta cheese and olives as the staple ingredients. Then other ingredients are often added, such as cos lettuce, capsicum or bell peppers, anchovy fillets, flat-leaf parsley and capers. Traditionally served as part of a meal, this is also substantial enough to be served as a light luncheon. Cut the tomatoes into quarters, then cut the quarters into wedges. Peel the red onion and slice into thin rings, then slice the cucumbers. Cut the feta cheese into bite-sized cubes. Place the tomatoes, onion, cucumber and olives in a large bowl. Scatter the feta over the top of the salad. Pour the dressing over the salad and toss. Sprinkle with chopped mint leaves. 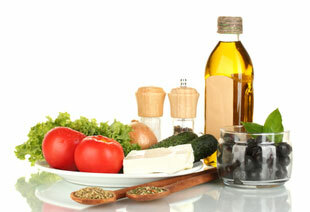 To make the dressing place the vinegar, oil and oregano in a screw-top jar and shake until well combined. How you serve your salad is purely a matter of personal preference. Simply spoon it into a serving bowl and serve as is, or if you prefer, line a bowl with cos lettuce leaves, then spoon the salad into the center. As feta cheese is fairly high in calories, if you are watching your weight, reduce the amount of cheese in this recipe.